The data on your iPhone, iPad or iPod touch is precious, but unfortunately there are many situations that your data can be lost or corrupted. When your data needs to be recovered, there is no doubt that you will look for solutions to this problem. One of the most popular solutions to iOS data recovery is iMyFone D-Back. But does iMyFone D-Back work? Let’s take a closer look at what this program is and how it can help you if you need your data recovered. Will iMyFone D-Back Help Me? 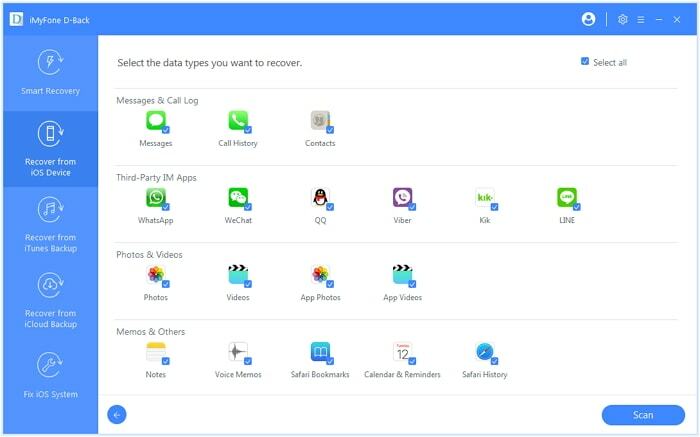 iMyFone D-Back is a recovery software program that can help you recover messages, photos, call log, notes and other files from your iPhone, iPad or iPod touch. It uses state of the art technology to increase the chances of recovery. The most common question people have when they hear about this application is: does iMyFone D-back work? The answer is Yes. iMyFone D-back is the most trusted data recovery tool in the market, and the countless users who have used it have left positive feedback can attest to its reliability and its high rate of data recovery. Users have found that of various recovery software programs out there today, iMyFone D-Back has a higher success rate as well as a greater ease of use when compared to other complicated ones. Please note that if your device cannot be trusted, you cannot recover data directly from your device. In this situation, you need rely on your backups. 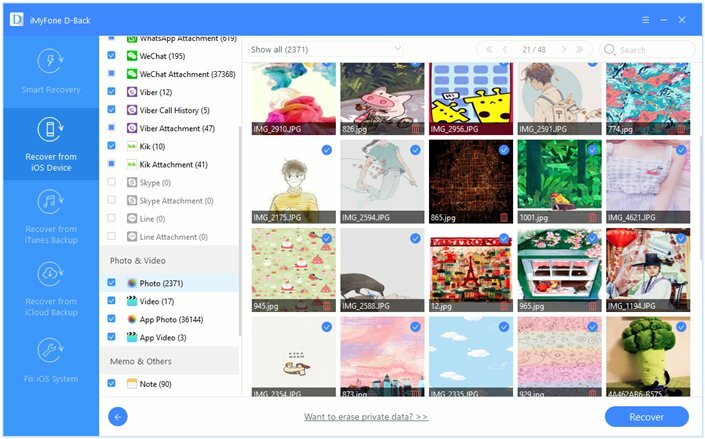 As a general rule of thumb, the program will be able to recover files as long as your device can still be turned on and isn’t completely destroyed. 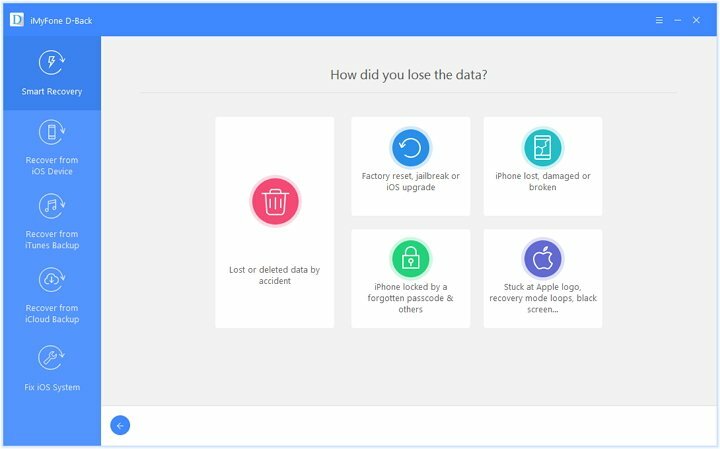 If you have lost data due to the above scenarios, then it is very likely that this application can help you recover your precious data. 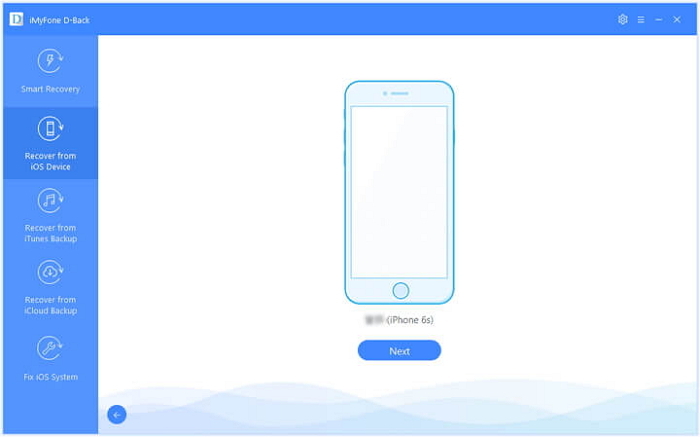 If you are interested in using iMyFone D-Back but you are worried about purchasing it at full price before knowing whether or not it can help you, then you are in luck: you can obtain a coupon code that allows you to get the application at a discount. To get the coupon code, follow the proceeding steps. Step 1: Go to the purchase page for Windows or Mac version. Add the program to shopping cart. Step 2: Enter the coupon code in the box marked "check to enter coupon code" and select apply. Step 3: Fill out the necessary information on the checkout page, add your payment method, and complete your purchase. A coupon is a great way to try out the full experience of this application without paying full price. You can also try the free trial version as an alternative. Generally, if the free trial version can find and preview the data you need, then probably the full version can recover them, also. Once you have purchased iMyFone D-Back, it’s time to start using the program to recover your data. The following are the 3 primary ways you can use to recover data from your device or backup. The way you chose will all depend on where exactly you want your recovered data to come from. For example, if you did not have your data backed up to iTunes or iCloud, then you will need to attempt to recover the data from your device directly. 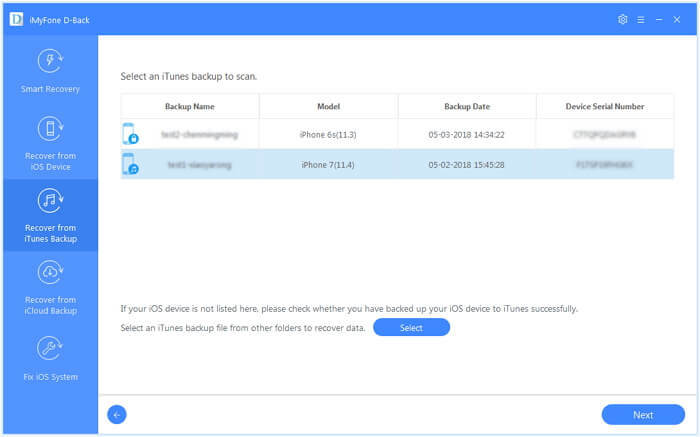 However, if the data is backed up on either iTunes or the iCloud, then you are able to recover what you want from backups. Take a look at the following 3 ways to use iMyFone D-Back and determine which one is the best option for your needs. Step 1.Launch D-Back and select Recover from iOS device. Connect your device to computer and wait for the connection. Step 2.Select the types of files you need and then select Scan. Step 3.Preview and choose what you want from the files presented on the screen. Select "Recover". Step 1.Open D-Back and select Recover from iTunes Backup. Choose the backup you want for this recovery, and then select "Next". Step 2.Select the types of files you want recovered and then start to scan. Step 3.All the recoverable data will be listed on screen, so you can preview and choose what you need to recover. After this process, the recovered files will be saved to your computer. Step 1.Run D-Back and select Recover from iCloud Backup. Then log into your iCloud account with your iCloud Id and password. 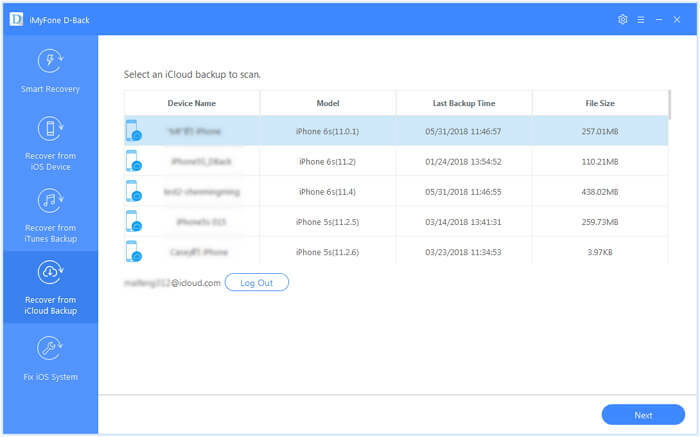 Step 2.Wait for the program to automatically detect all of the iCloud backups attached to your account and then pick the backup you want, then select Next. Step 3.Select the data you need and then select Scan. Step 4.Pick what you want after previewing and then select "Recover". You may be wondering what the real differences are between using the iMyFone application and simply restoring from iTunes or iCloud backup. Let’s take a closer look at the pros and cons to determine which is the best option. iTunes and iCloud do not allow you to preview the backup content before restoring, but D-Back can. iTunes and iCloud only allow you to fully restore the backup, but D-Back can allow you to selective choose what you want. Fully restoring iTunes and iCloud will replace all your current data, but D-Back will not affect your current data on device. If you have lost data on your iPhone, iPad or iPod touch, then you will need to take the necessary steps to recover your data. You should reflect on the above methods carefully in order to figure out which one is the best option. Do not hesitate to have a try!